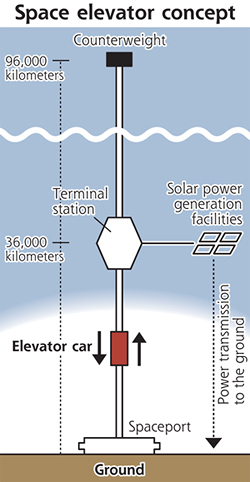 Japan's Obayashi Corp. has announced their intention to build a space elevator. Although the original insight for space elevators came to Russian scientist Konstantin Tsiolkovsky in 1895, sf writers have been encouraging scientists and builders to construct a space elevator for generations. "If the laws of celestial mechanics make it possible for an object to stay fixed in the sky, might it not be possible to lower a cable down to the surface – and so to establish an elevator system linking Earth to space?" This material was also called hyperfilament in the novel. Via Yomiuri. Thanks to Adi for pointing this story out.